Here's a quick one before my battery dies. You know, the problem is there's usually not more than one or two books that come to auction each month that I'm interested in... so the buying slows down... Planets? Plenty of them out there (thanks to GAtor this month!) ECs? All over the place, but the "lesser" titles (which I find more fun to collect)... well they just dont come to auction/sale all that much, which means when they do there's a lot of competition. I've got a few more shots chambered, but I wont have the books in hand until my trip back to the states in December. more write ups in the coming weeks, I promise! Great journal - really enjoying it. That makes the hunt all the more enjoyable IMO. What Ditch said! Good luck this month, I'm looking forward to more posts on this great theme you collect! In the selling area here. I still can't believe you haven't been going after EC. I mean...I'm actually completely flabbergasted and bewildered. though Incredible Science Fiction #33 is my favorite cover of the EC line, and Wally Wood cant be beat. I think down the road I might get a few really interesting ones, but they dont quite hit in my strike zone for what I love about the Sci-Fi books in the 50s. The "Funny Animal" ones are more fanciful and whimsical than the sci-fi writer/artists that Im loving who were trying to express some real thoughts about what space might be like, or trying to work through some of the real apprehension people were feeling about space travel and exploration during the 50s. There's one Life with Archie (that has Harpies on the cover) that will get into my collection at some point when/if a decent high grade one surfaces. maybe another one will come up in a decade. Well after breaking the seal with the Space Adventures #25 I decided to go for the gusto and try and put together a top Space Adventures set. The books come to market so infrequently (in high grade) that I figured my lack of funds would match nicely with lack of purchasing opportunities! 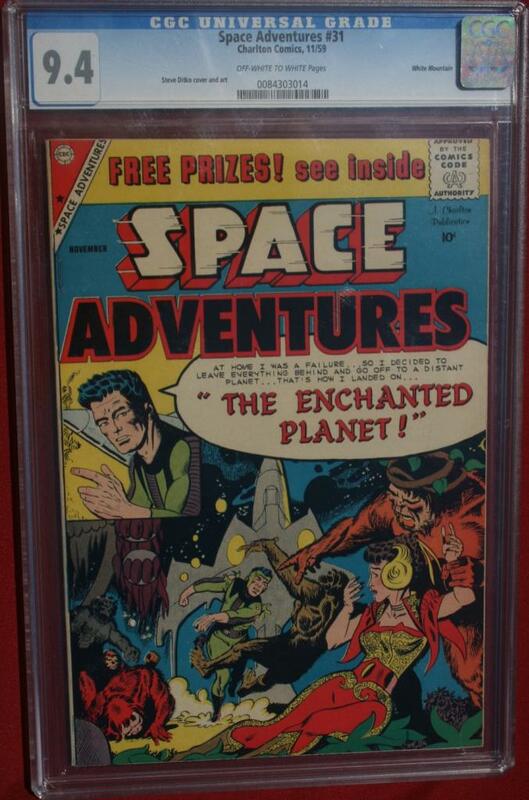 The Space Adventures #27 is from the White Mountain pedigree and is amazing in hand. That actually got me interested in trying to find more pedigree books in the title. And lo-and-behold this book showed up on eBay the day I left to return to Europe (so it sits waiting for me to pickup at the house on my next visit). Space Adventures #28 is from the Big Apple pedigree, and while it's only an 8.5 it has great colors. I really like the cover to that #25 and it's nice to see your update! Now if only there were more high grade copies on the market! Well it's been a little while! For the last year I've curtailed my buying since I was having a heck of a time finding a job here in Belgium (turns out at most places, people want you to speak the language of the country if you're going to work for them!) We've been living off one income, so I had to let books pass me buy, and in fact do a bit of selling to help pay bills. My Captain Science #6 and Strange Worlds #4 went to new homes, but they helped me pay bills and make it to 2016, so that was a good thing. Hapily at the end of 2015 I got a job offer with AB InBev (Anheuser-Busch-International Beverages) here in Belgium, so I could start buying again! In a couple bits of divine providence, there was nary a Space Adventures book to hit the general market (at a price I'd be willing to pay) during 2015 while I was looking for work. I think there were a couple of mid-grade #33s that have hit the market, but those are just skyrocketing these days so I think I'm going to have to let that one go for now and focus on the other issues. In the second bit of cosmic synergy, just a few days before getting my first paycheck from my new job I got a PM from the boardie who I previously did a deal with for the SA25. At the time of the deal he thought he also had a SA31, but after checking his inventory he apparently had sold/traded it away previously. I was a bit saddened (though staring at the SA25 helped), but moved on. Any way he drops me an email and say's "guess what I just got back in trade?" Yep the SA31. So here it is, From the White Mountain Pedigree (which makes my second one from that pedigree), another lovely Space Adventures for my collection. Some sweet classic Ditko cover action to boot! I just cant do it. It's like buying a house with mold. Except worse, because cleaning the mold adds value to the house, but if you clean the staples, hello conserved label. ah the joys of collecting. I think we have similar collecting tastes with Sci-Fi. I'm trying my best to put together a nice run of Space Adventures 1-12, so seeing #12 listed on the boards had my blood pumping for a minute. Until I saw the rusty staples, that is .